For years GIVI Asia Sdn Bhd, Asia’s leading motorcycle accessories brand, has pioneered the practice of ‘safety first’ and as it evolves with the needs of its customers, the company maintains committed to this principle; providing world-class products that protect the well-being of motorcyclists all over the region. Today GIVI Asia introduced the latest in its product line-up at GIVI Asia Headquarters in Bukit Beruntung; the B27 Clack Box and limited edition M50.0 Malaysia Boleh Helmet. 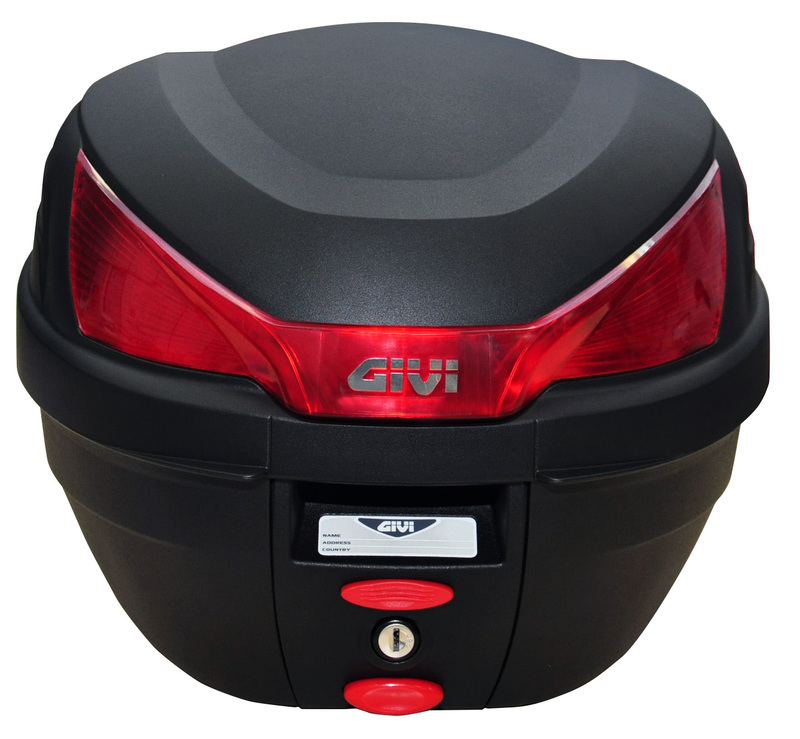 GIVI motorcycle boxes (top cases) are the result of more than 30 years’ experience in careful attention to detail and caring for the needs of riders. The B27 Clack Box is an urban styled, aerodynamic addition to the GIVI top case family; constructed of tough and durable PP material. 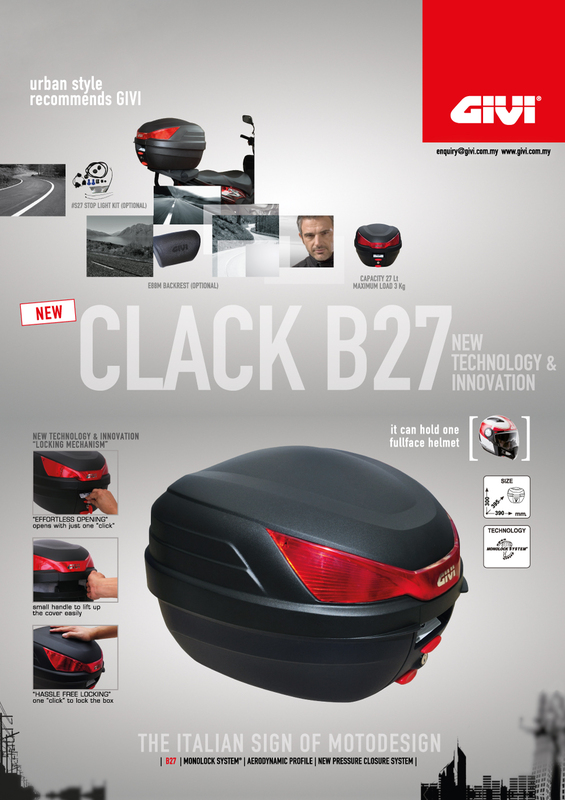 The B27 Clack incorporates the latest patented technology and innovation already featured in the higher range boxes from GIVI Italy. The “one-click opening/locking” mechanism is designed with a small handle to lift the cover with ease. This latest box can comfortably fit one full-face helmet and carry a maximum load of 3kg. GIVI Asia continues to emphasize the importance of selecting a helmet that is the best fit and as with all its predecessors, the M50.0 Solid White Malaysia Boleh helmet was developed with exceptional quality and safety in mind. The M50.0 is a full-face helmet and an all-season alternative to the jet helmet. 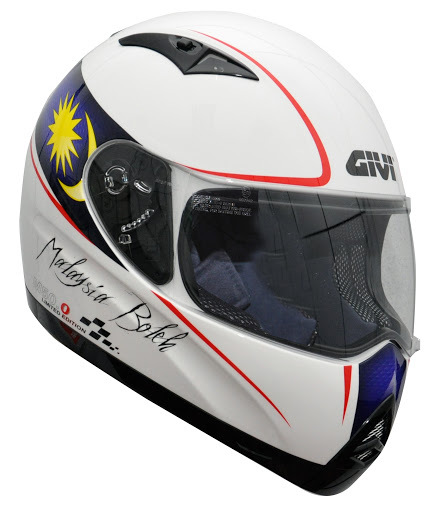 With a techno polymer shell, the helmet is available in a trendy decal which proudly displays the colours of the Malaysian flag and sports the words ‘Malaysia Boleh’; making it the ideal token for Malaysians with a patriotic spirit. Comfort is ensured with two frontal air ventilation systems which guarantee a continuous air flow inside the helmet, lining made of anti-allergy material that is removable and washable and the vented nasal cover that helps the removal of fogging caused by respiration. The visor is removable and made of anti-scratch material. A snap release buckle and chinstrap adjustment makes it comfortably secure. The B27 Clack Box Standard is priced at RM135.00 while the price for M50.0 Solid White Malaysia Boleh Limited Edition Helmet is RM280.00. murahnya helmet tu… mane leh beli? ?